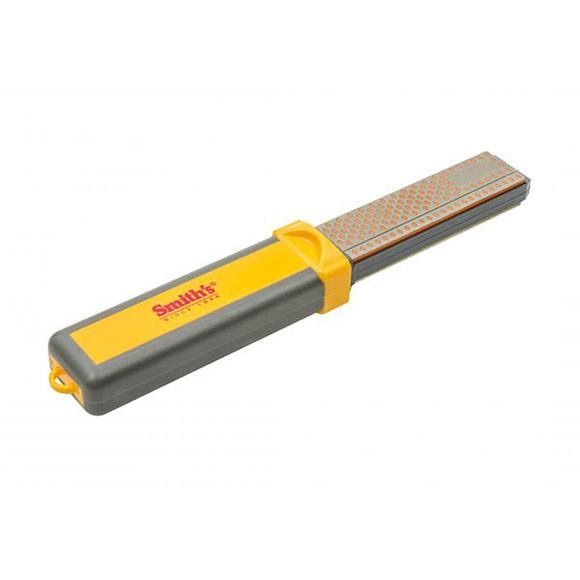 Smith's Abrasives 4" Diamond Combination Bench Stone features coarse and fine grit sharpening surfaces. These surfaces contain multiple layers of micron-sized moncrystalline diamonds and a unique sharpening surface with an overlapping oval hole design. This innovation speeds sharpening by collecting and holding the metal filings which ordinarily build up during the sharpening process. Smith&apos;s Abrasives 4" Diamond Combination Bench Stone features coarse and fine grit sharpening surfaces. These surfaces contain multiple layers of micron-sized moncrystalline diamonds and a unique sharpening surface with an overlapping oval hole design. This innovation speeds sharpening by collecting and holding the metal filings which ordinarily build up during the sharpening process. Each stone has a "micro-tool sharpening pad" and a sharpening groove for fish hooks or pointed tools. The soft grip rubber handle is designed to make sharpening safe and easy, and when you are finished sharpening, you can store your stones in the handle for safekeeping.